Many owners of large lawns find that it is rather time-consuming to mow their lawns with aregular push or self-propelled lawn mower. For this reason, many of these owners decide, sooner or later, that the best solution in their case might be the purchase of a riding mower. On the market, there are available two main types of riding mowers, lawn tractors and zero turn mowers. In this article, we are going to talk about the zero turn mowers, showing you which are the main differences between the two types of riding mowers and how to choose a zero turn mower. Then, consult our selection of mowers reading our best zero turn mower reviews to decide which one is the right zero turn mower for you. What Is the Difference Between Zero Turn Mowers and Lawn Tractors? How to Choose a Zero Turn Mower? Let’s find out more about these versatile lawn mowers. Lawn tractors and zero turn mowers are two machines designed to help you maintain the beauty of your lawn in a more convenient way compared to their walk-behind counterparts. The choice of many lawn owners, these machines represent excellent choices for those who have large lawns and for the lawn care professional. Basically, both the lawn tractors and the zero turn mowers are designed to perform the same tasks, namely to cut the grass fast and efficiently, but there are some differences between them. First of all, the zero turn mowers are more expensive than the lawn tractors. Nevertheless, many lawn owners and professionals prefer the zero turn mowers over the lawn tractors. The main reason is the mowing pattern, which is the most obvious difference between the two types of riding mowers. Zero turn mowers mow the grass faster and more efficiently thanks to their narrower turn radius. Another essential difference between the zero turn mowers and lawn tractors is the way you can control the machine. Lawn tractors are generally equipped with a familiar steering wheel and pedal, while the zero turn mowers are typically controlled with the help of two handles that are also used for braking. The handles control all the wheels of the machine, making it possible for the zero turn mowers to make tight turns. In this way, the zero turn mower can mow closer to all sorts of obstacles, including fences, trees or driveways. This characteristic is appreciated by many lawn owners because it significantly reduces the use of trimmers or reel mowers to manicure the aspect of the lawn. Another big plus of the zero turn mowers is that they allow a better visibility to the ground, which will make it easier for the operator to spot any obstacle. The cutting deck size is also different between the zero turn mowers and lawn tractors. Lawn tractors typically have cutting decks of up to 54 inches, while the zero turn mowers can even have cutting decks wider than 60 inches. While many people believe that a wider deck is better, the truth is that the right size of the deck should be decided based on the characteristics of your lawn. A wider deck might pose problems if it can’t fit between stationary obstacles present on your lawn and it could be harder to maneuver around trees and fences. If your lawn is placed on a hill with a steep slope, a zero turn mower might not be the right choice for you. Zero turn mowers are difficult to control on slopes and, if the slope has more than 15 degrees, you might lose the control over the machine. While the l﻿﻿awn tractors are also difficult to control on steep slopes, they are still more stable and more recommended to use in these cases. On the market, there are available three types of zero turn mowers. Depending on the type of your lawn, your experience and use purpose, you should decide which of these types is best for you. These mowers are recommended for lawns of about 1-2 acres positioned on a flat terrain with no slopes, ditches or rocks. Compared to the lawn tractors, these zero turn mowers cut the grass faster and more efficiently. The prices are more affordable compared to the other types of zero turn mowers, while they are manufactured with various cutting deck sizes to suit the needs of all lawn owners. The only downside of these mowers is that they are not efficient on sloped terrains. The engine power typically ranges between 16 and 21 horsepower. If your lawn is placed on a hill with a slope of about 15 degrees or less, or if you are a professional landscaper in search of inexpensive equipment, an intermediate zero turn mower might be the right choice for you. The mowers in this category present many of the heavy duty characteristics of the commercial zero turn mowers,they have affordable prices and work well for lawns up to 6 acres. Compared to the residential zero turn mowers, these machines are more powerful, have wider cutting decks, larger gas tanks, and bigger tires to ensure a smoother ride. With an engine power ranging between 22 and 27 horse powers, these mowers are equally appreciated by regular lawn owners and professionals. Designed specifically for the professional landscapers, these zero turn mowers are sturdy, they don’t have any plastic components and have a better stability on sloped terrains compared to the other types of zero turn mowers. They are ideal for everyday use, boasting powerful motors of 27 horse power and above.Although the price of these zero turn mowers may seem inaccessible to the average users, the truth is that the durability and time-saving features are worth the investment. These machines are ideal for lawns larger than 6 acres and feature heavy duty decks that are usually over 60-inch wide. In addition to these three types of zero turn mowers, we should mention the stand-on zero turn mowers. They have many characteristics of the intermediate zero turn mowers but are extremely maneuverable even on steeper slopes. The first step to take when choosing a zero turn mower is to determine the right type of the mower based on the information above and on the characteristics of your lawn. Since there are incredible differences between the residential zero turn mowers and the commercial zero turn mowers in terms of quality and durability, our advice is to choose the most valuable mower you can afford. Regardless of which type of zero turn mower you decide to buy, here are a few things to consider before making the final choice. Durability: as zero turn mowers are pretty expensive machines, it would be a wise idea to invest in a durable machine. You should check the overall sturdiness and the construction of the deck before making any purchase. Deck construction: since the cutting deck is the most important part of any lawn mower, it is obvious that the things don’t change much in the case of the zero turn mowers. Typically, residential zero turn mowers have steel decks that are stamped in a press, while the commercial zero turn mowers have the cutting decks made of several pieces. The decks in the first category are less durable than the other ones and they don’t perform well on rugged terrains. You should also check if the cutting height can be adjusted to fit the type of grass you have to cut. Easy to adjust cutting height: ideally, you should be able to adjust the cutting height by operating a foot lever. The cutting height must be easy to adjust especially if you have to mow over small obstacles such as exposed tree roots or rocks. Avoid buying a mower that requires you to stop and adjust the cutting height manually. Engine: when it comes to engines, we have only one advice, choose a powerful one. The cheapest models are usually equipped with single cylinder engines, while the commercial grade mowers have twin cylinders. Comfort: the seat should be comfortable and have a back support. In addition, the control panel of the zero turn mower should be easily reachable from the seat and easy to see. Also, check if the manufacturer sells all the desired accessories or find out which accessories are compatible with the model you want if the manufacturer doesn’t make them. Wide tires: if you want the mower to have a good traction, the width of the tires is essential. In addition to the better traction, wide tires also provide smoother rides as they distribute the weight of the mower over a larger area. Easy to operate: especially if you are a novice, you should choose a zero turn mower that is easy to operate and control. You should be able to adjust the speed of the mower easily. Typically, you should use a higher speed to mow the flat lawns, while a reduced speed will improve the maneuverability of the machine on slopes or rugged terrains. Now, let’s see our best zero turn mower reviews that will help you choose the right machine for your lawn. Made by the renowned farm equipment manufacturer John Deere, this zero turn lawn mower boasts a powerful 20 horse power V-Twin hydrostatic gas motor and a 42-inch cutting deck. This zero turn mower is designed specifically for the residential use, providing an efficient mowing thanks to its superior trimming abilities. The ACCEL DEEP mower deck is designed to maximize the airflow and increase the cut quality at faster speeds, by lifting the grass as much as possible. The large wheels with wide tires ensure a smooth ride and better performances on slopes, in addition to a better traction. Comfortable: the operator platform was designed for maximum comfort, having a comfortable 15-inch seat and convenient controls. Getting on and off the mower is simple and easy, there is an ample legroom and the controls for height and position are placed in a way to be easily reachable from the chair. Powerful motor: this zero turn mower is equipped with a 20 horse power V-twin engine designed for lower vibration, greater torque, and fuel economy. The engine also boasts a fast electronic ignition and cast iron sleeves for a longer lifespan. Convenient control panel: the operator control panel boasts color-coded controls that are easy to identify and a light fuel warning that is visible in daylight. Accessories available: for this zero turn lawn mower, the manufacturer makes a mulching kit, a mower deck leveling gauge and other useful attachments that will improve your mowing experience. All the accessories must be purchased separately and this will increase the final cost of the mower. One of the best zero turn mowers available on today’s market, the Swisher ZTR2460BS Response features an excellent 24 horse power engine and a hydro gear transmission, offering an exceptional acceleration and a smooth transition between the speeds. 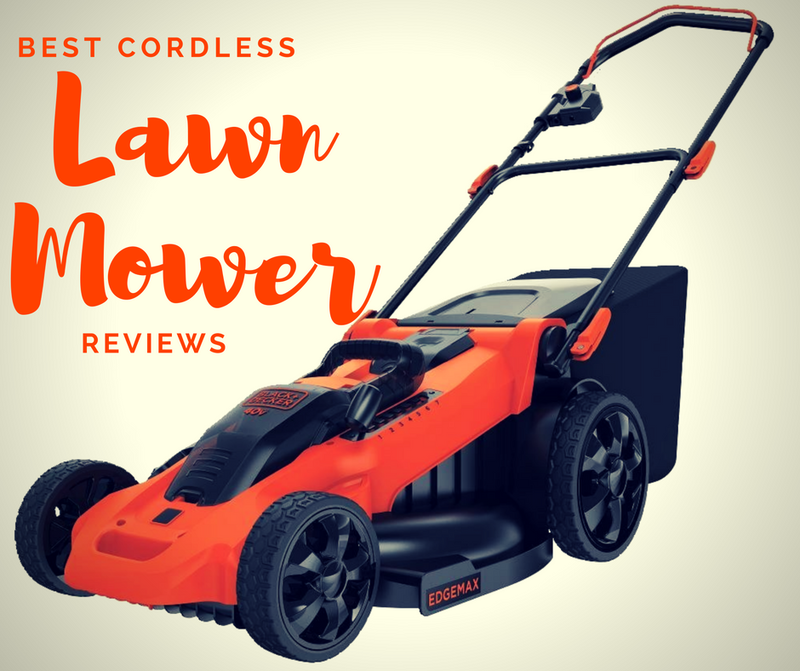 This mower is both powerful and easily maneuverable even in tight spaces, thanks to the full turning circle and to its low gravitational center. In addition to these great features, this zero turn mower boast an ample cutting deck that is not stamped but fabricated in commercial grade steel. This is one of the greatest characteristics of this zero turn lawn mower, because the deck is more durable compared to the stamped models, while the overall price of the mower corresponds to an intermediate type. Exceptional speed: this lawn mower can easily reach 8 mph in both forward and reverse, beating out other similar mowers in terms of efficiency. In addition, this mower is easily maneuverable and fairly safe to use on almost any type of terrain thanks to its low center of gravity. Large fuel tank: this mower was designed for large lawns and prolonged use, its 8 gallons fuel tank containing enough fuel for intensive use. Easy to adjust cutting height: the cutting height can be easily adjusted by operating a foot lift. The 11-gauge cutting deck is equipped with three Gator cutting blades that provide a fine mulching of the grass. 12-volt adapter: to provide instant power for trimmers and edgers, this zero turn lawn mower is equipped with a 12-volt adapter. This lawn mower is not suitable for small yards because of its overall dimensions. 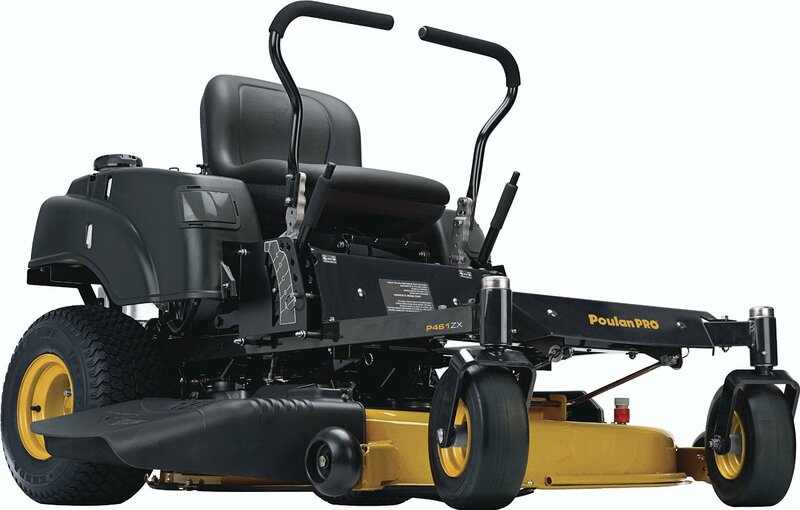 Another excellent zero turn lawn mower is the Poulan Pro 967330901 P46ZX, a machine equipped with a powerful 22 horse power Briggs & Stratton engine. Designed to offer the best performance, comfort, and durability, this zero turn mower is exceptionally maneuverable thanks to its dual hydro transmission that allows you to control each wheel independently. This exceptional maneuverability allows you to drive the mower over small obstacles and around the large ones with an incredible ease, reducing in this way the mowing time. But not only. You will also be able to mow the lawn closer to the obstacles and this will limit the use of trimmers or push mowers. Reinforced cutting deck: this mower boasts a two-bladed reinforced steel cutting deck of 46-inch wide that comes with a 10-year warranty. Several cutting heights: you can choose the most suitable cutting height based on the type of grass you have from the 6 available heights. The cutting height can vary from 1.5 to 4 inches. Three years limited warranty: you will have plenty of time to test the performances of this mower because it comes with a 3-year limited warranty. Comfortable: this zero turn lawn mower is equipped with a comfortable 15-inch seat with an extra high back, and with an easily accessible control panel. Despite the great performances, this zero turn lawn mower has a rather small fuel tank of only 3.5 gallons. Built to last a lifetime, this zero turn lawn mower from Troy-Bilt features a 22 horse power Briggs and Stratton twin engine and a dual transmission designed for a better maneuverability of the machine. This lawn mower also features an 18-inch comfortable seat and a heavy duty frame made of reinforced steel. This Mustang 46 24HP 46-Inch Zero-Turn Mower also features large and ergonomic lap bars designed to fit operators of all sizes and that automatically engage the parking brake as soon as you open them to stand up. For more versatility, this zero turn lawn mower is also equipped with fast attach accessories. A wide range of accessories: this zero turn lawn mower is compatible with all Fast Attach accessories manufactured by Troy-Bilt, all of them mounting on the mower without the use of any tools. The accessories include mulch and bagging kits as well as kits designed to improve the balance and traction of the mower. 46-inch dual-blade cutting deck: the 13-gauge stamped steel deck is equipped with anelectric power take-off for a faster and easier blade engagement, as well as with a deck wash port. It also features an 8-position cutting height adjustment. Comfortable seat: the 18-inch seat is provided with a dual suspension for smoother rides. Dual transmission: to improve the maneuverability, this lawn mower is equipped with a twin hydro dual EZT transmission. Although designed for large lawns, the extremely small fuel tank capacity of only 2.8 gallons will limit you a lot. 5. 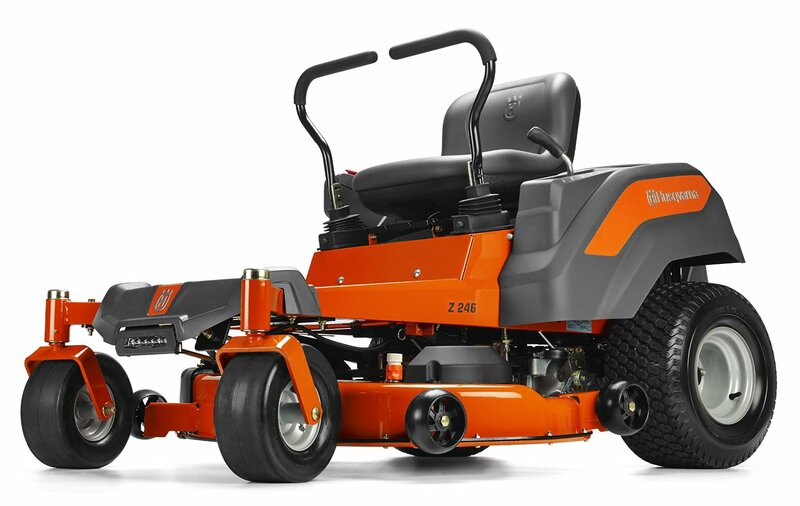 Husqvarna 967323903 V-Twin 724 cc Zero Turn Mower, 46"
Similar to some of the other mowers reviewed, this 967323903 V-Twin 724 cc Zero Turn Mower, 46" from Husqvarna is also powered by a Briggs & Stratton engine. The 23 horse powerengine is designed to provide enough power for the 46-inch reinforced steel 13-gauge cutting deck. To improve the user experience, this mower boasts a convenient headlight that will allow you to mow the lawn even in the evening, while the manufacturer also produces a series of accessories. Auto start: this zero turn lawn mower has an automatic choke system that enables the mower to start easily without requiring any special input. Available accessories: the manufacturer produces a series of accessories for this zero turn lawn mower, including bagging boxes and mulching kits. Headlight: you will be able to mow the lawn at any hour thanks to the convenient headlight. Operator controlled discharge chute: for more efficiency, this lawn mower boasts an operator controlled discharge chute that can be temporarily closed if needed. This is a residential zero turn lawn mower and it doesn’t work well on slopes. If you want to pick a zero turn mower, you should be able to select your favorite from our best zero turn mower reviews. In our opinion, the best zero turn mower available on the market is the Swisher ZTR2460BS Response 24HP 60-Inch B&S ZTR Riding Mower.We mostly like the powerful 24 horse power engine and the hydro gear transmission, but the other features also make this machine excellent. Being easily maneuverable, you will not have to worry about driving this mower between any types of obstacles, such as trees or fences. The ample cutting deck is made of high-quality parts and it is able to mow the lawn fast and efficiently. The incredible speeds of up to 8 mph of this machine will make the lawn mowing a fast operation, while the low center of gravity will allow you to maneuver this machine with ease even on sloped terrains. Furthermore, the large fuel tank and the easily adjustable cutting heights are other important features. Another characteristic we love is the 12-volt adapter that will provide you with instant power for the electric trimmers. In this way, you will be able to manicure your lawn fast and easily, without worrying about the cord extensions. So, if you have a large lawn, you should consider this mower when choosing the best zero turn lawn mower for your yard.